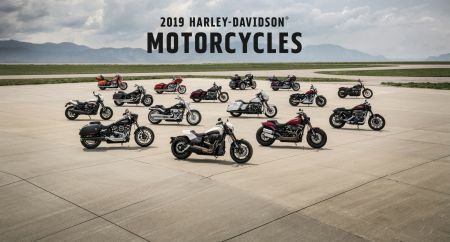 Heather Malenshek, Harley-Davidson Vice President of Global Marketing: "Harley-Davidson's innovation is infused in all of the new products we are offering for 2019. Innovation in design, innovation in technology, and innovation in performance will inspire Harley-Davidson fans and a new generation of riders to share the wide-open freedom of motorcycling." The FXDR 114 is equipped with the most-powerful engine offered in the Softail chassis, a Milwaukee-Eight 114 V-Twin tuned to punch out up to 118 ft-lb. of torque at 3,500 rpm. The strong – and rigid – Softail chassis and premium suspension components will reward assertive riders with thrilling agility when riding through twisting backroads and navigating congested urban traffic. The FXDR 114 offers a leaner angle than any other Softail model. (See separate release for complete details on the FXDR 114). The all-new electronic Reflex Linked Brake system for 2019 Harley-Davidson Tri-Glide Ultra and Freewheeler three-wheeled motorcycles incorporates Antilock Braking System (ABS), Traction Control System (TCS), Drag-Torque Slip Control System (DSCS) and linked front and rear braking system; features that work together to inspire greater rider confidence. Select 2019 Harley-Davidson Touring and Trike motorcycles will be powered by the Milwaukee-Eight 114 engine. At 114 cubic inches, the Milwaukee-Eight 114 engine has the most displacement offered from the Harley-Davidson factory in standard model motorcycles and delivers strong acceleration and overtaking performance. (See separate release for complete details). Three limited-production 2019 Harley-Davidson® Custom Vehicle Operations™ (CVO) motorcycles offer show-stopping finishes, advanced technology, exclusive components and extreme attention to detail. The high-performance Milwaukee-Eight® 117 engine is exclusive to CVO models and the new Boom!™ Box GTS infotainment system is standard on each 2019 CVO™ model. The new Dominion™ Collection offers the unique ability to personalise individual accessory components for almost unlimited custom options. This collection is offered in gloss black anodized and bronze powder coated base colours and features interchangeable trim pieces in brushed black, bronze powder coated, brushed orange anodized or brushed aluminium that can be added in any combination. This premium accessory collection accentuates a bold, high-performance riding style. Performance-enhancing Screamin' Eagle® Stage Upgrades are engineered to generate specific torque and horsepower gains, eliminating all the guesswork and trial-and-error testing normally associated with engine modifications. The new 4.5-inch Screamin' Eagle® Muffler for the Harley-Davidson Sport Glide® model enables Screamin' Eagle® Stage I through IV. New Screamin' Eagle® Timer Cover & Inserts for the Milwaukee-Eight engine show off "what's inside…" with a premium metal medallion labelled with 107, 114 or 117 displacement and the Stage level. The urban riding environment demands riding gear that is built to offer protection, comfort and mobility. The new FXRG® Gratify Slim Fit Leather Jacket and Men's FXRG® Slim Fit Riding Jackets combine contemporary style with real coverage and comfort features, including a moisture-wicking Coolcore® lining, power-stretch materials for improved fit, lightweight CE-certified removable body armour and engineered perforations to help release body heat. Riders can pair these jackets with new abrasion-resistant FXRG® Armalith® Denim riding jeans.